I made a video showing off the latest creation of mine. This is a Cigar Box Ukulele and it is adorable. It sounds great with or without an amp and is nice and light and easy to play. There isn’t much else I’d like to add that isn’t already addressed in the video, so enjoy! Our Apparel Shop is Up! We went ahead and made a T-shirt! The shop is set up and there will be more designs coming in the future. Please check out our T-shirt shop at Threadless Artists Shops. You can also find a link directly to our designs in the menu bar. Between gossip, office politics, errands, and keeping up of appearances, life can get pretty tiring. That’s the time to just go and play a tune on your Cigar Box Guitar. Leave your worries behind and simply enjoy the sweet melodies and the surprisingly complex tones coming out of such a simple instrument. The Cigar Box Guitar isn’t trying to keep up any appearances, nor is it there to judge anybody. It’s great! We have this design in Men’s, Women’s, and Kids’ styles for T-shirts. We offer over 10 different colors, as well as a Hoodie option for those colder days (like in Canada, where we reside). That’s all for today! Keep checking back for more interesting Cigar Box Guitar related posts. Choosing an instrument can be a very difficult decision. Do you want something that is shiny and new, or would you rather have an instrument that looks like it has been played at every blues bar across North America over the past sixty years? Do you want something bright and attention-grabbing or would you rather have something less obtrusive, grabbing people’s attention with the melodies you create? Selecting a Cigar Box Guitar (CBG) is different for everyone, but when you do select a CBG, you have more variety to select from than any other type of instrument. What is important to you in an instrument will be reflected in your selection. You might want to start with string selection. While 3- and 4-string CBGs are the most common, you can go for a 1-string (commonly called a Diddley Bow), a 6-string, or anything inbetween. Different CBGs use different types of strings; the most common are light steel strings, but they tend to range from medium to extra-light. Nylon strings can also be used instead of the more typical nickel- or copper- wound steel strings. What type of neck would you like on your CBG? While most use some type of hardwood for the neck, softwood could be used instead. And for smaller CBGs you can find some unique re-purposed items used for the neck (broom handles, hockey sticks, etc.). In addition to the type of wood used, you can also select the type of fretboard you would like. 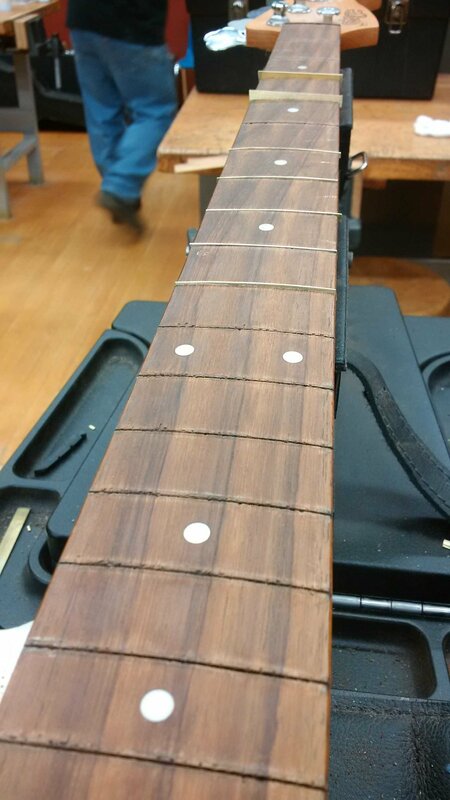 While almost all CBGs will have the fret positions marked, not all CBGs are fretted. Whether or not you want frets, or what type of pattern or colour you want on your fretboard is entirely up to you. You should also decide if you want an electric or acoustic CBG. Acoustic CBGs should create enough sound to fill a room, but if you want to get loud you’ll need an electric. And with an electric, you have to decide what type of pickup you’d like: Piezo or Magnetic. You can even choose to add Humbuckers if you’d like. The body of the CBG is what really sets the instrument apart from all other instruments; after all, it is why they are called Cigar Box Guitars. Despite the name, not all CBGs are made from cigar boxes. They can be made from metal biscuit tins, used oil cans, old license plates, wooden toilet seats…just about anything that you can imagine. And even when selecting among cigar box bodies, the choices are all but limitless. Select a body that speaks to you and you can’t go wrong. Cigar Box Guitars are as individual and varied as the people who play them. When selecting your CBG, remember that there are no bad choices, it’s whatever you want your instrument to be. I am currently taking a Guitar Repair and Design course under the tutelage of Mike McConville. This man’s a genius, and he’s very very very good at what he does. If you have an unplayable instruments that you area looking to make usable again, he’s your man. If you are looking to enhance your instrument to bring you to the next level of playing, he’s your man. Anyway, I want to talk a little bit about Picasso. When I say Picasso, what do you envision? Perhaps something like this comes to mind. Three Musicians is, after all, one of his most famous pieces. However, here is one of his early works. Well? Not to shabby for a sixteen year old, huh? The reason I am taking a course on actual guitar design is to fully understand how *real* instruments function. Not to say that my instruments aren’t real…. but they are certainly not traditional. I’m a firm believer of studying the foundations before attempting to build on top of it. The form factor of guitars have developed over a long time. Learning what works and how it all comes together is a very humbling experience. A lot of thought has gone into making guitars throughout the ages. Stumbling into making my own without learning what I can from the best would simply be blind arrogance. I am from a visual arts background so my initial instinct is form. I have to continuously remind myself that function precedes form in these cases. At the end of the day, it has to play, and play well, or it is essentially useless. Therefore, I am happy to say that in order to build better mini instruments, I am learning how a full-sized one operates. On top of that, the course is ridiculously fun! If you have the time and means, I highly recommend it. Here are some pictures of my latest work on a bass guitar. I am converting it from fretted to fretless. It is still a work in progress. 4 string sliding on this unique fretless guitar. Bright box colour, and unique wood-filled fret markers adorn this beautiful instrument. “Rules do not make ART”, that’s the message of this fretless guitar. Perfect for sliding and creating beautiful sounds. 007, James [Bond] is a cool guitar. 4 string, which can be tuned open or like the highest 4 strings of a standard tuning guitar, it offers versatility no matter the situation. Magnetic pickup with tone control, as well as shiny abalone fret markers makes this one awesome guitar. RenBert Designs’ debut 4 string guitar. Play chord melodies with the familiar standard tuning (highest 4 strings of a 6 string guitar). This guitar also features magnetic pickups and tone control. Fretted 3-string with piezo pickup has a stylish design and sink-drainer sound hole covers. Abalone fret markers and unique headstock makes this instrument stand out. Tin can creates a resonator quality to the tone. This instrument is fretted and sports a cool wood-burned design. This is the twin of Dominic, sporting a different neck design. Tin can creates a resonator quality to the tone. This instrument is fretted and sports a cool wood-burned design. Smooth and cool looking Ukulele with a warm tone. Plug it into an amp to add a punch! Great action for smooth sliding and great positioning of the volume knob makes this instrument easy to play. Perfect action for playing slide guitar. The volume knob blends in with the design of the tin. Treble clef inspired sound holes makes this instrument truly unique. Sink drain sound hole and metallic volume knob gives this guitar its unique look. Low action and great tone. Thanks to those who stopped by our booth at Altekrea! We currently do not have any other events lined up, like us on facebook to keep posted! This venture is home based. We hope to see you this summer at various events!